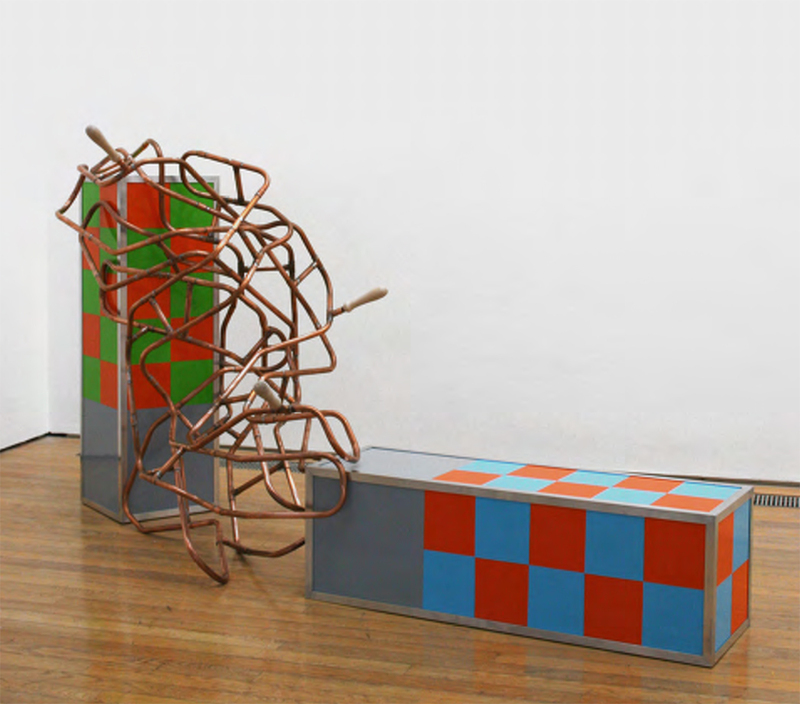 Throughout Charlie’s practice there is a concern for the construction and fabrication of sculptural structures, the manipulation of materials and visible methods of assembly, which in turn references production and manufacturing. Often the seemingly simple act of transforming 2D flat sheet material into 3D volumetric form is part of the creative process. Particular emphasis is placed on the coexistence of disrupted 3D forms and reflective lustrous surfaces and makes reference to both sculpture and painting. Applied and often artificial colour (often through the application of gloss paint) makes reference to both protected and decorated surfaces whilst the use of discordant colours and geometric design suggests dual concerns associated with attraction and caution. The disrupted forms and structures suggest both uncertainty and movement. 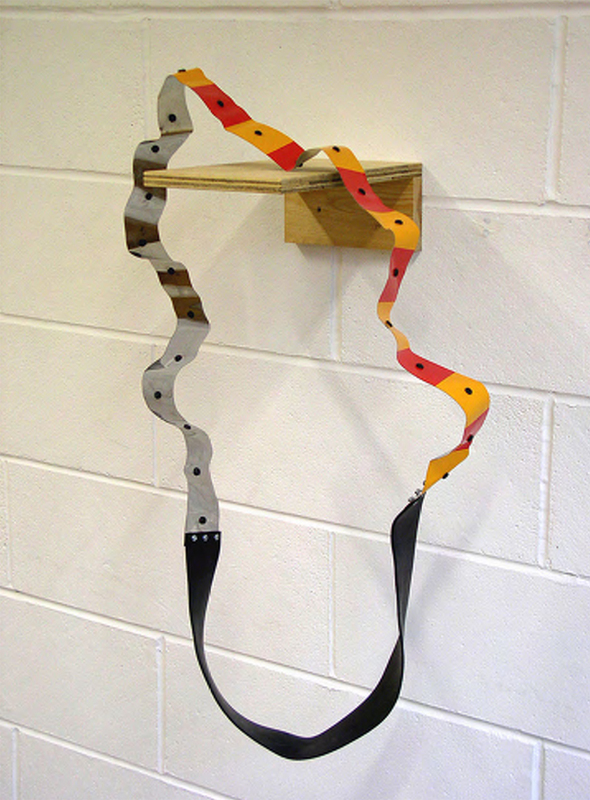 Whilst completing an artist-in-residence at the University of Wolverhampton (ends May 2015) Charlie is utilizing various workshops and equipment to machine sheet aluminium, plywood, perspex and clear cast resin blocks. 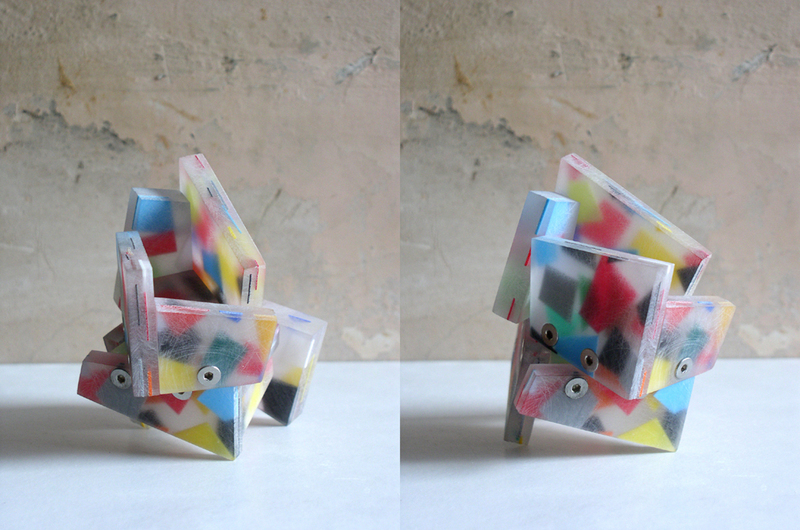 All of these materials are at a point of being ‘re-cycled’ (the clear cast resin blocks incorporate reclaimed plastic) – being either from previous projects or collected from a local scrap store over a period of time. The sculptural form of this new work is a development of concerns initially explored within a piece called ‘Intertidal’ (made as a commission in 2012) where small sections of clear cast resin (embedded with coloured plastic) were cut and assembled into an angular twisted form. As with this piece the methods of assembly and construction of the new work – the nuts and bolts – will be visible. Current concerns for this project focus on exploring combined aspects of the Baroque and Minimalism. This is Charlie’s third residency at Stiwdio Maelor.